As skeptical as I was that ZombiU would have staying power after the Wii U launch, I must say, the game's multiplayer in which one person manages zombies and the other tries to fend them off really won me over. Those of you who held off on the console might be interested in a new ZombiU Deluxe Set releasing in the US and Canada on February 17, 2013. 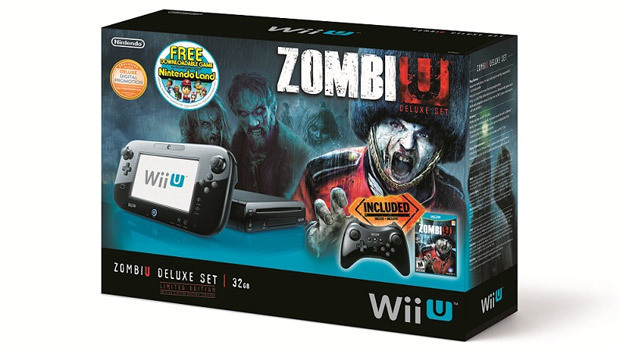 For $389.99 -- bear with me for a second -- this includes everything in the normal Wii U Deluxe Set (various stands, the GamePad Cradle, 32GB of internal storage) plus ZombiU, Nintendo Land as a download instead of on-disc, a black Wii U Pro Controller, and a collectible art book for ZombiU. Should this seem worth jumping on, don't forget to earn those points!